I received the latest Layla order today and did a whole lot of swatching. I actually really enjoyed it. I swatched all the Layla Mirror polishes and I can't wait to show them to you. 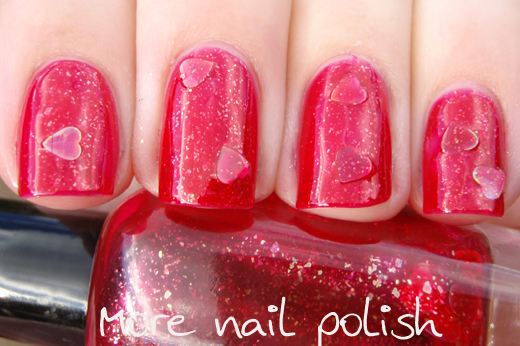 But first here is a monstrous custom polish I created and called 'My heart bleeds for you'. The idea was magical in my head, but oh dear it's not a nice outcome in the end. But hey, I'm here to show you the ugly creations, not just the pretty ones, so listen up on how not to create this. In my head I imagined a red jelly with gold flecks - check. Then floating in the golden blood polish were sparkly golden holo hearts - check. Unfortunately the gold hearts are lost in the richness of the red jelly and don't even look gold anymore, and they seem to stick out something terrible. One of my worst yet. I hope this post makes other frankens feel better about some of their FRANKEN FAILS! They happen to everyone. You know what though? I really love this polish! I'd just take out the hearts. The jelly and flakes are so so beautiful!!!!! I agree! It would be great sans hearts! I love it without the hearts! 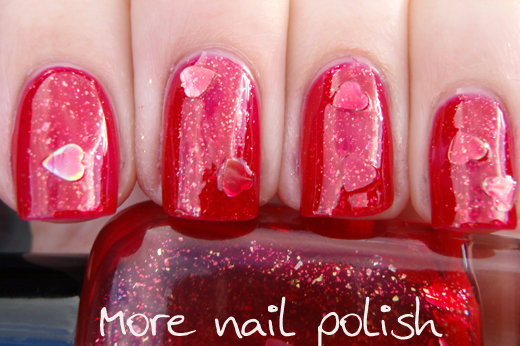 This is such a pretty mani :) That would be so nice for Valentines Day! Yeah I quite like it. I'm sure you are able to avoid the hearts anyway. It's kinda sad for the rest of us that your fails are so good too. Great polish, so not a fail! 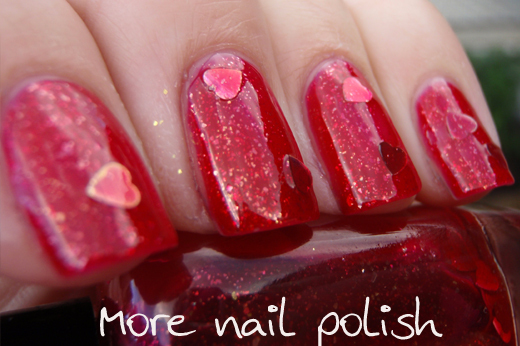 I'd just omit the hearts from the polish itself but if u wanted to wear them just individually place them on a wet mani, that would rock! You must be really good at frankening because when I think fail, I think super ugly brown/green. It's already been said but this is sooooo beautiful! I'm sure it wouldnt be so hard to not use the hearts. Your nails look like candy. 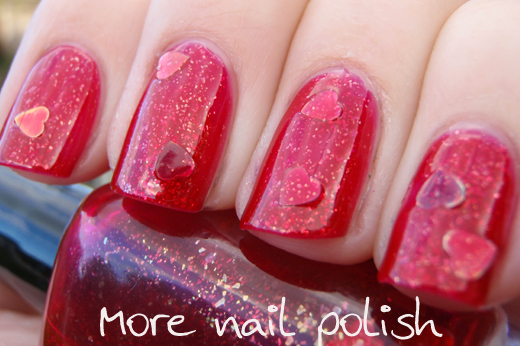 <3 The hearts do stick out a little too much, but the jelly color and shimmer is really lovely. I really like this polish! The hearts do stick out, but minus that I think this is great! I love this polish, I buy it I love it so much! I still think it looks cool! Thanks everyone for your comments. I'm going to attempt to get the heart glitter of the polishes and make the holo gold hearts into a top coat instead, then layer that over. Hahaha this is pretty with the hearts? Though the jelly polish is goergous!! !